A 64-year-old man presented to our hospital because of dyspnoea. Twenty years ago, he had started peritoneal dialysis (PD) for chronic kidney disease. He had been diagnosed with secondary hyperparathyroidism 7 years before his presentation to our hospital, with an intact parathyroid hormone (PTH) 1227 pg/mL (normal range 10–60 pg/mL), calcium level of 10.1 mg/dL (normal range 8.8–10.5 mg/dL), phosphorus level of 5.5 mg/dL (normal range 2.4–4.1 mg/dL) and alkaline phosphatase level of 377 IU/L (normal range 140–338 IU/L). His medications included cinacalcet. Ultrasonography showed a 5-milimetre nodule at the lower pole of the parathyroid, but 99mTc-hexakis2- methoxyisobutylisonitrile (MIBI)scintigraphy revealed no abnormal accumulation. The patient’s intact PTH increased to 2606 pg/mL 6 years prior to presentation. At that time, the patient deferred parathyroidectomy. A year later, he switched from PD to haemodialysis. Intact PTH remained elevated to more than 4000 pg/mL. His thorax became scoliotic curving to the left. He had experienced dyspnoea on exertion for 1 year, presenting to our hospital for an exacerbation of these symptoms. His vital signs on presentation were as follows: body temperature 36.1°C, blood pressure 88/40 mm Hg, heart rate 108/min, a respiratory rate of 24/min and an ambient air oxygen saturation of 88%. His chest examination revealed bilateral diffuse inspiratory crackles. His arterial blood gas analysis values were: pH 7.14, pCO2 89.6 mm Hg, HCO3- 29.8 mEq/L. 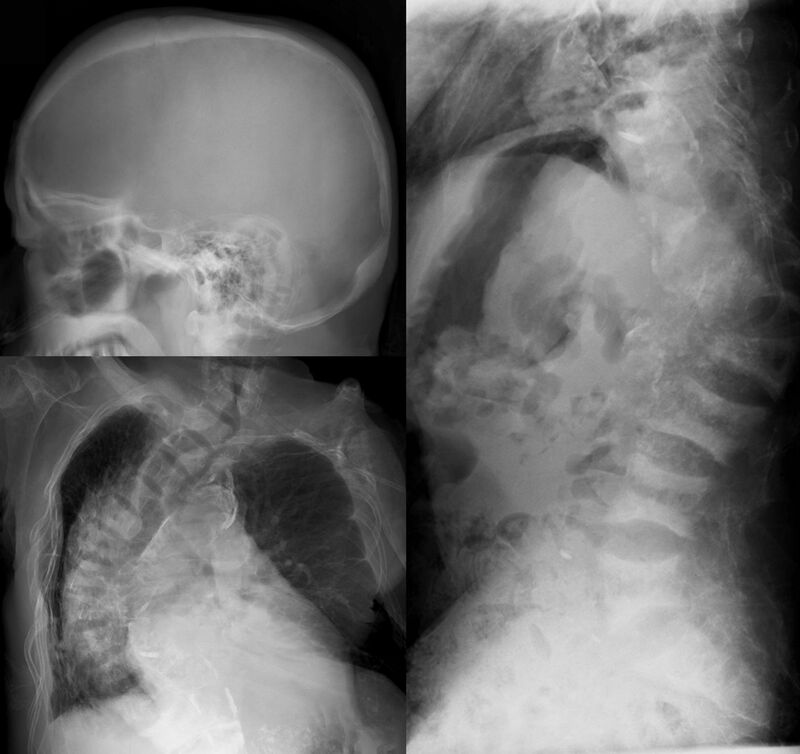 Chest radiography demonstrated cardiomegaly and remarkable thoracic deformity. His echocardiography revealed mild mitral and severe tricuspid regurgitation with probable pulmonary hypertension. We diagnosed the patient with type 2 respiratory failure and pulmonary hypertension due to severe thoracic deformity. He was intubated and placed on mechanical ventilation for 2 days. After receiving 75 mg of cinacalcet, the patient recovered and was discharged home in 2 weeks. A month later on repeat admission, he died secondary to pneumonia and an exacerbation of his pulmonary hypertension. 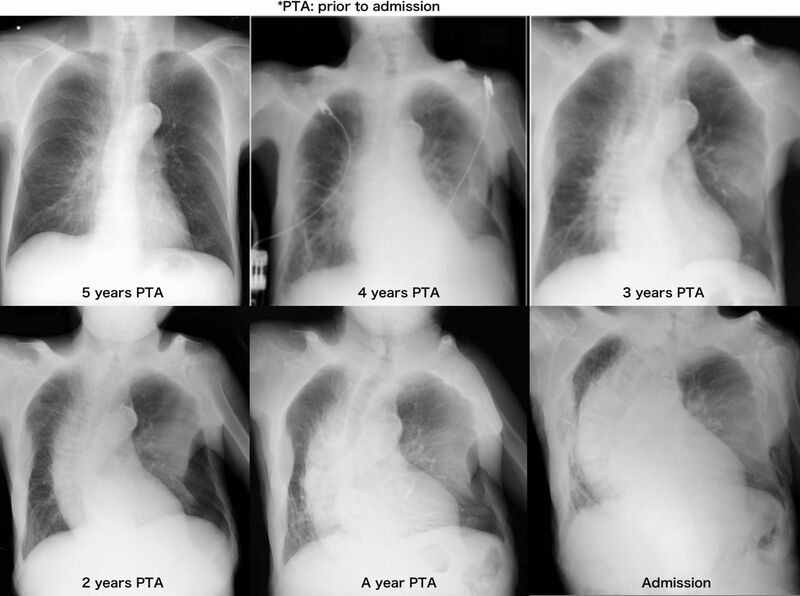 His chest radiography changes over 5 years are shown in figure 1. The chest radiography demonstrates thinning of the ribs and curvature of the vertebrae to the left, resulting in significant volume loss of the left lung. Chest X-ray (CXR) changes over 5 years. The CXR demonstrates thinning of the ribs and curvature of the vertebrae to the left, resulting in significant volume loss of the left lung. Figure 2 reveals multiple rib fractures, rugger jersey spine and cortical thickening features classically demonstrated in chronic kidney disease–mineral bone disorder (CKD-MBD). Reveals multiple rib fractures, rugger jersey spine and cortical thickening features classically demonstrated in chronic kidney disease–mineral bone disorder. This case illustrated untreated CKD-MBD, leading to increased bone fragility and fractures. Varying combinations of low bone mineral content and bone quality contribute to bone fragility. Osteitis fibrosa due to secondary hyperparathyroidism is one form of CKD-MBD characterised by high bone turnover, in which typical radiographic features are present as seen in this case. Life-threatening bone deformity is a rare complication of CKD-MBD as vitamin D receptor activators and calcimimetics such as cinacalcet significantly reduce the incidence.1–3 Parathyroidectomy in combination with calcimimetics would be the choice of treatment to retard the progression of bone deformity. Untreated chronic kidney disease–mineral bone disorder (CMD-MBD) causes life-threatening bone deformity. Repeated education and proper medications are needed for management of CKD-MBD including adjustment of calcium, phosphorus and hormonal abnormalities. Contributors SA, NN, HM, MK: meet authorship criteria and were listed as authors. All authors certify that they have participated sufficiently in the work to take public responsibility for the content. And also participated in the concept, design, analysis and writing of the manuscript. Furthermore, each author certifies that this material or similar material has not been and will not be submitted to or published in any other publication before its appearance in the BMJ case reports.